Interior Express Outlet is owned and operated by our parent company Wholesale Interiors which is an importer/distributor of furniture. We have been in operation since fall of 2002 serving the local Chicagoland area stores as well as over 20 major Ecommerce Websites. 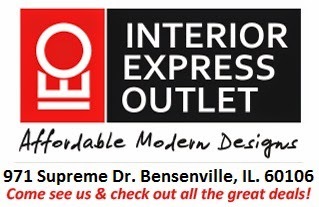 We also sell our products to the general public nation wide via our retail website InteriorExpress.com. We once reserved our floor models and photos models strictly for the local Chicago stores but since we've expanded our now 400+ product line, we've extended our best deals to include the local Chicagoland public. This website is designed and intended just for our local deals on discounted furniture for a various number of reasons. Some of our products are overstocked, floor models, photo models, unship-able products, liquidation, or bump n' dent products. Any bump n' dent products will mention any damage within the ad and be priced accordingly. Everything listed is either within our 130,000 square foot warehouse or currently sitting on our showroom floor. Pickup from our location is of course free but if you do live locally we offer delivery on select items up to 40 miles from O'Hare starting at $85. If you do decide to pick up your order, you must come before 4:30PM. We are open Monday thru Friday from 9am - 5pm as well as 10am - 6pm on the Weekends. We are located one block west of O'Hare airport.